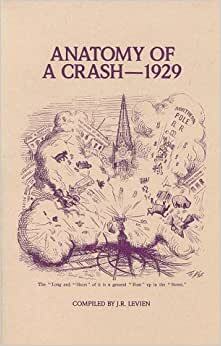 Compiled by Levien in 1966, offering a clear picture of the events that happened during the 1929 Stock Market Crash together with an idea of what people thought was happening. Actual material is taken from the pages of the New York Times during 1929. There is a chronology of financial events for the year and a listing of new articles during the Crash. Paper. 121 pp. Written in 1966, when the stock market was at a high, this little book is a nice synopsis of several things. Levien takes different angles from the news of the times. They include a look at General Motors’ history in the decade, a New York Times chronology of the crash, monthly charts of the averages, a review of the crash by Richard Whitney, some charts for technical analysis, and some NYT articles during the panic. The book is 121 pages and has a least two different covers; the one shown above, and another that just has the title superimposed over newspaper stock quotations. Good starter for a quick read on the Crash that could lead the reader to get ideas for looking at other more in-depth sources.